We at SB Greenhouses believe that everyone should be able to enjoy the unique pleasures of growing flowers and crops in their own home. That’s why we make it our goal to help you find the perfect greenhouse kit for your lifestyle and needs. 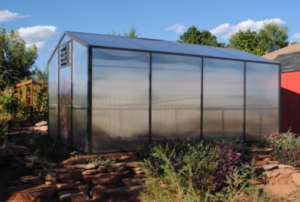 We proudly offer a wide array of high quality, American-made greenhouse kits that come with all parts pre-drilled for easy assembly. If you’re looking for a DIY greenhouse kit, you won’t find a better place to find one. Don’t just take our word for it though – let the many people who’ve purchased our kits tell you about how effective, reliable, and beautiful our greenhouses are. I wanted to take a moment to say THANK YOU for providing a solution we have searched for since this past February when we attended the St. Louis Home Show and purchased a Twilight 240 Series Hot Tub with the intent of adding a sunroom addition to the back of our Home. After three and a half months, our contractor (Chesterfield Fence and Deck) could not get the project through the STL County Building Inspection and were not confident they could build it to both their and our satisfaction. So they refunded our deposit – that’s when we needed a Plan B and your greenhouse became our (my wife’s) preferred option and are we ever glad we did! We purchased your Deluxe Kit (cedar/glass – 9′ X 16′) for $5495 and paid for the shipping. Now – the construction was a job. We hired two men (one a trade carpenter, the other a condo maintenance man at $52 per hour total). It took the equivalent of three full days at 10-12 hours per day. Cost for labor – just under $2,000. My wife was out there as the “Project Manager” – she is excellent at reading directions and leading. There were mistakes made and some re-do’s . . . . but we couldn’t be happier! With the subfloor build (approx. $1500 to level on our concrete pad) – all-in cost was under $10,000. The old “sunroom” – while larger (288 sq. ft. vs 144 sq. ft.) – was going to be $49,000!! Great savings and we are so happy! It houses both the hot tub and a large daybed. Just taking a minute to send some photos of our lovely, perfectly-functional, Montecito greenhouse (16’ x 9’). It has taken us all summer to construct and start operating but we took our time with it and we spent quite a while on the foundation and water lines. I can’t say enough great things about the Montecito. The fan and sprinkler system are the perfect answer to providing the ideal environment. The panels allow an even distribution of light and hold the warmth. I am truly amazed and impressed by the growth and progress I’ve seen with my plants (currently cacti and succulents) in just the few short weeks that they have been inside. Cacti are budding and adding new growth (in October). The seedlings are visibly larger and flourishing. It’s simply delightful! Contrary to the photo, greenhouse benches are now loaded with ferns and other tender species requiring a warmer winter climate. Hoping to be able to purchase another slightly larger Santa Barbara greenhouse within the next few years. We were so impressed to note that the greenhouse package includes everything (tools and grommets and rivet gun, too! )The only concerns that we have had are about a few instruction details. Santa Barbara Greenhouse specialists have been extremely helpful in answering all of our questions and calls. Thank you so much for working with us, guiding us when necessary, and for helping us make a dream come true. 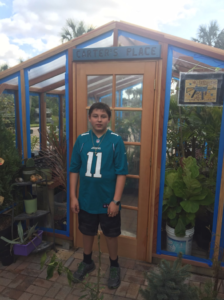 We gave a greenhouse to our son Carter as a Christmas present! The greenhouse is amazing. January 2, 2017: 80 degrees and sunny. Needless to say we have not needed the heater. Thought you would appreciate these photos of my 11’x 24’‎ Santa Barbara Deluxe up in New Meadows, Idaho. This photo was taken Jan 12, 2017, with a healthy dose of snow so far this winter. I’ve put two vertical ‎metal adjustable poles in to support the roofline at 8′ and 16′ stations and erected the greenhouse in 2014. This will be the third winter with no problems. You’ve designed an outstanding product line with excellent quality materials. Our water line to the interior sprinkler system would freeze, so I haven’t attempted any winter plantings. 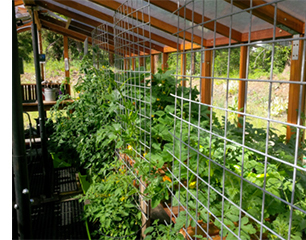 Our elevation is at 3800′, so our seasons are short, ‎the greenhouse really makes our veggies (tomatoes, peppers, green beans, carrots, cucumbers) excel! We use the Earthbox system, which has performed very well. Finished my greenhouse just before thanksgiving, then got a little sidetracked with the holidays. It went together as advertised. Pretty much an easy two person job if you know how to use a tape measure and a level. Most time-consuming part was putting in the footer. After that, it was a piece of cake. Used pavers and gravel on the inside. Then weed cloth and gravel bordered by pavers on the outside. Very good product. Had a lot of fun putting it together. 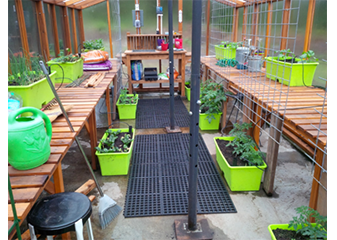 Thought you might like to see one of your lean to Greenhouses, this is a 10′ x 20′ one that was installed just over a year ago. 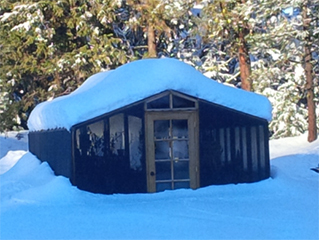 Record snows this winter, and the greenhouse has sailed right on through it. 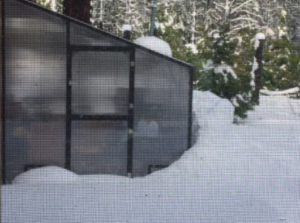 The wall of snow on the outside is against a six foot polycarbonate wall which is standing up on a two foot pony wall. The roof managed to shed the snow all on its own; it does have a heater that is set at about 45 inside of it which may have helped somewhat. Thanks for a great product. Do you have some suggestions as how it could be made a little better? In general, it’s working just fine. 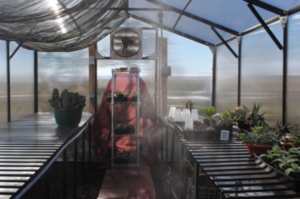 If you’re looking for an affordable DIY greenhouse kit, you’ve come to the right place! We encourage you to request one of our free catalogs so that you can see our full selection of greenhouses. If you have any questions or you’d like to purchase a greenhouse kit, please don’t hesitate to call us at (800) 544-5276. We look forward to hearing from you and helping you select a backyard greenhouse kit that’s just perfect for you!